Home » About Us » News » Press Releases » Congratulations to Lilian! One of Casa de Esperanza’s female students, Lilian, graduated from the National Honduran Autonoma University this past June, with a bachelor’s degree in psychology. 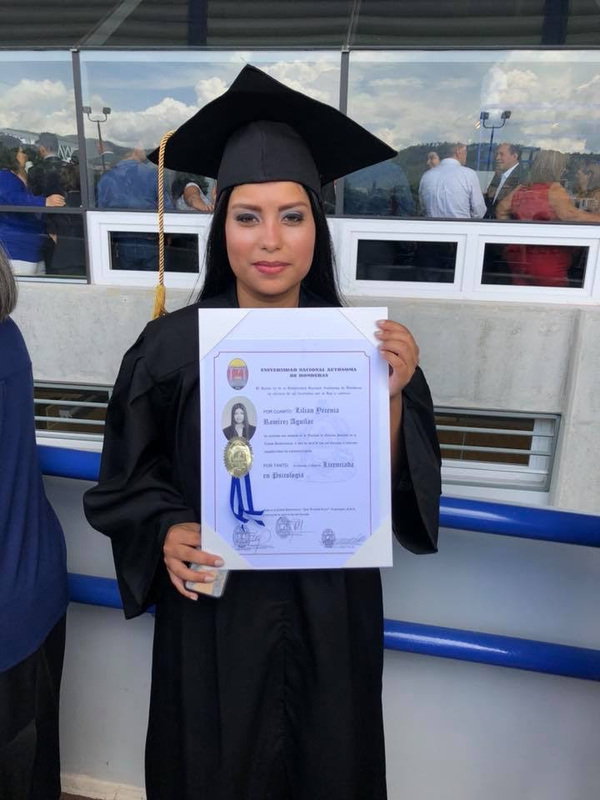 Lilian has been with Casa de Esperanza since she was 12 years old and has worked very hard over the years to reach her goal of graduating from college. We are very proud of her! Lilian also secured a job right after graduation with UNICEF (the United Nations Children’s Fund). UNICEF works collaboratively with the United Nations. It provides humanitarian and developmental assistance to children and mothers in developing countries such as Honduras. Lilian was assigned to work in Dolores (which translated into English means “pains” or “anguishes”), a municipality in the Honduran department of Intibucá. This is about a 2-hour drive from Siguatepeque. She is provided with room and board through UNICEF, along with a minimum wage salary. She works in the Municipal Building and has a small office on the second floor, overlooking the mountains. She works out an annual plan for activities for the children of the 12 communities surrounding Dolores. Her first goal is to make a network of people that work to protect the children in these communities. Lilian travels to different schools to educate students on subjects such as bullying, good nutrition, preventing teen pregnancy, the dangers of drugs and alcohol, and the importance of staying in school. She works with 15 young people, ages 13 to 15, training them to be leaders in their schools. UNICEF gives the funds for these activities and is currently conducting a large study on children’s rights in Honduras. World Vision is also active in the area, so Lilian works with leaders from this organization and also with the Honduran government’s child protection arm, known as “DINAF.” She has had to remove children from at-risk situations in her first month on the job. Congratulations Lilian on this very big accomplishment. May God keep you safe and guide you on this new adventure!